with a Foreword by Dale A. Burk. The coming bi-centennial of the famous Lewis & Clark Expedition has led to this detailed look at their travels in upper Missouri River region of Montana. In this, the second of their series on the Expedition focusing on the Corps of Discovery's travels in Montana, takes a detailed look at the Corps' arduous journey in 1805 from Fort Mandan to the crown of the Continent at the Continental Divide, the drainage of the upper Missouri River. For those wanting a fresh and clearly-written comprehension of the Corps experiences on the upper Missouri written with special emphasis on the Corps time spent on the Missouri in what is now Montana, this is a must book. 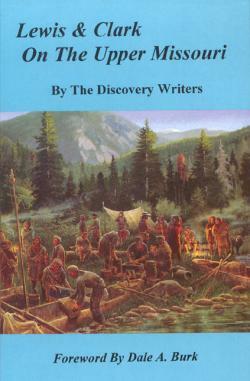 Detailed day-by-day description with a special focus on the critical parts of the journey, in particular their ability to cope with difficult and changing conditions across the spring and summer, the portage of the Great Falls of the Missouri, what they recorded and commented on in terms of nature, wildlife and the land itself, a special chapter on Sacajawea. In another unusual twist to provide context, the Discovery Writers included many "sidebars" that provide historic and geographic descriptions of what has occurred along the route since the time of the Expedition. This is a big, well-illustrated, timely and very lucid book with a stunning cover painting done by artist Robert F. Morgan of Helena, Montana. 224 pages, 6x9 format, many photographs and illustrations, 16-page color section featuring art and photographs. Make the quilts about the Journey!